The magazine Roots started publication in 2002 and perceives itself as a multiethnic magazine for science, culture, literature, and civil affairs. This review has a multiethnic and multilingual character, thereby enabling the authors to work in their preferred language: either their own language or Macedonian. All texts written in a language other than Macedonian are then translated into Macedonian, except for poetry and prose, which is presented in the original version. Contents are widespread, from poetry and essays, to historic events and discussions. The magazine is composed of five separate parts: Ambient, Mosaic, Poetic Endeavours, Images, Events, History, and “Retro” (not in all editions) with works from the authors published in older, similar multiethnic magazines. Roots is a magazine in which creators from various regions participate. 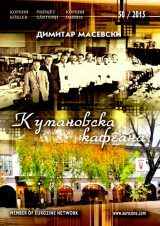 The magazine is published by the Association for Science and Culture Paradigma from Kumanovo, Republic of Macedonia. This association aims to engage the creative potential from this region in all five communities in the region of Kumanovo, especially in the field of literature and poetry, but also all free-thinkers and intellectuals who have something to say about what is happening in the country in the field of multiethnic relations. The editorial office makes a serious effort to engage young, creative people and talents for writing all over Macedonia. Despite the fact that the association is relatively new, members of the association are experts in their fields with many years of experience. The imperative for creating an opportunity for young people was posed by everyday life in Macedonia, where lethargy and pessimism ruled for a long time. Roots is bringing together young people from different nationalities and strengthens their acquaintances, since people from different ethnic nationalities live in the region of Kumanovo: Macedonians, Albanians, Serbs, Turks, Vlachs, and Roma, amongst others. Roots presents famous Macedonian authors, as well as young talents for poetry and prose, creating written material from the field of social life, poetry, reviews, essays, literature, history, profiles, etc. Everyone participating in the making of the magazine works on a voluntary basis, but the great interest and results achieved lead to the employment of at least one person.